Prof. Dr. Mabel Alvarez, Editor just distributed the latest issue of the IDE Ibéroamerica Newsletter. As liasion Ms. Györgyi Gödér has been appointed. 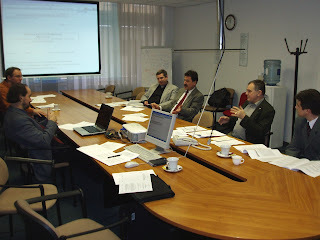 She delivered a presentation on the European Water Framework Directive related govrnmental tasks at the HUNAGI Forum hosted by the Methodological Centre for eGovernment, Budapest on October 11, 2007. HUNAGI discussed the INSPIRE-related planned amendments of existing law. Participants discussing the approach, agreed in general comments and submitted contributions of member institutions of HUNAGI.